These are just a few examples of what you might experience when a suspension part is failing or has already broken. A vehicle’s suspension is made up of different components depending on the model vehicle you have. 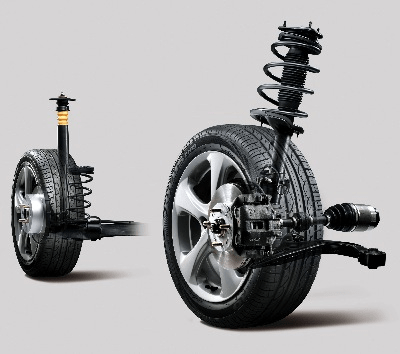 The most common elements are the shocks, struts, springs, and tires. However, some BMW’s utilize a Coilover shock system for improved performance. Often time suspension components will be grouped with steering components because they frequently work together. For instance, control arms can be seen as both because the spring will rest on them. Struts are a structural part of the suspension. It will not only dampen what you feel on the road, but it also keeps stability in check. These significant parts of your suspension should require replacement when needed. How Important is a Suspension Inspection? All the parts of your vehicle need to be in good condition to give you the best ride possible. The suspension system is no exception. To identify any problems an inspection can help. A suspension inspection is not a long process, but it can determine many issues your car might be having. The examination will including looking at the shocks and struts for leaking fluid, weak springs, and how the tires are wearing. After the inspection is completed, you should be alerted to any issues. Replacing parts that need to be replaced can stop from other costly repairs. Continuing to drive a vehicle with worn out suspension can cause steering components to wear out prematurely. It can also cause tires to need to be replaced sooner. The suspension of your vehicle works together so that you won’t feel every bump in the road. If you aren’t wanting to have a sore back from a car bouncing and swaying, then it is a good idea to have an inspection done and correct any problems.